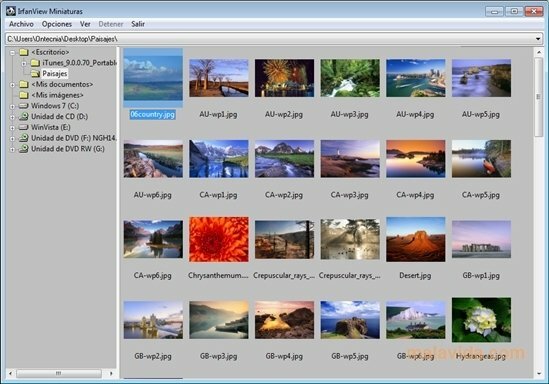 IrfanView is an application that will allow you to view a photograph collection without complications without having to renounce to the basic options, something that the image viewer that Windows offers per default can't compete with. Customization of the image presentation on the screen by means of the configuration options. Integration of the toolbar adaptable to the needs of each user, by adding or eliminating icons. Possibility to activate the viewing of the notes integrated into the TIF images. Optimize the images by gamma correction. Automatically rotate the images, according to the EXIF information. Add new functions by means of plug-ins. All in all, IrfanView is a very easy-to-use image viewer that adapts to the needs of any user, thanks to the vast amount of options that it integrates.